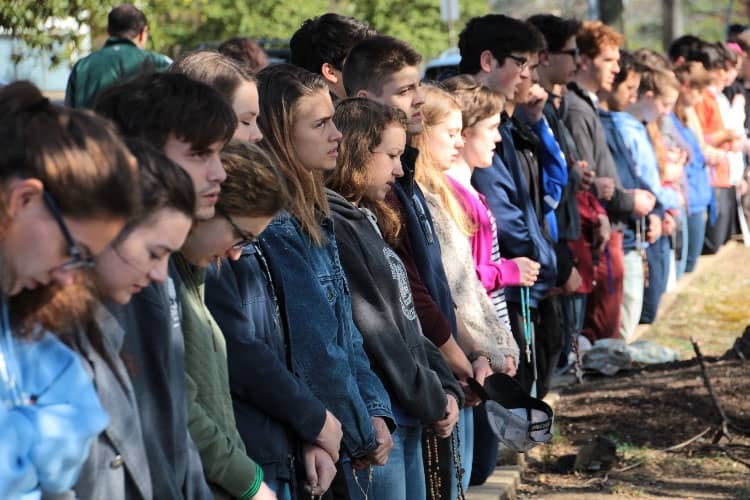 A busload of students, as well as members of the faculty and staff, traveled into Northern Virginia early on Saturday morning, April 6, to join with Diocese of Arlington Bishop Michael Burbidge in prayerfully protesting the horrors of abortion. The event, a pro-life vigil organized by the diocese and also Christendom’s pro-life group, offered a powerful witness to the sanctity of life and the strength of today’s pro-life movement. 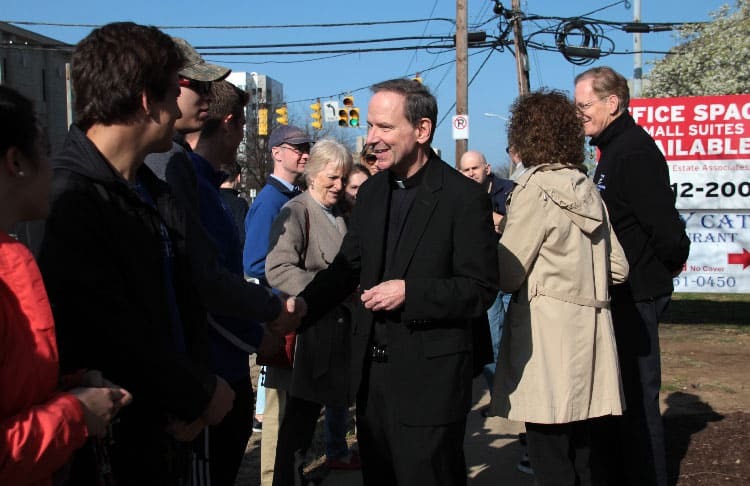 The students were invited to participate in the event by Bishop Burbidge, who sees Christendom as one of the champions of the pro-life cause in the diocese. The college joined with him for Mass at Queen of the Apostles Church in Alexandria, Virginia, before following him to an abortion clinic located at Landmark Towers. There, all present lined the block, praying rosaries throughout the morning. Shield of Roses drives into Northern Virginia every Saturday morning during the academic year to protest abortion. Typically, a dozen or so students make the trek, but every semester the group organizes a Mega Shield event to bring the whole school together in this mission. Doing it with the Bishop this spring made the event that much more special, with around 100 students attending to show support of Christendom’s home Bishop and the pro-life cause. Shield of Roses is Christendom’s oldest student-run group, founded the first year of the college’s existence in 1977. Advised by the history department’s Dr. Brendan McGuire, Shield of Roses has featured numerous inspiring leaders over the years, some of whom have been awarded “Volunteer of the Year” awards by the Diocese of Arlington. Clinics protested at by the group have even closed down, including three over the past five years.